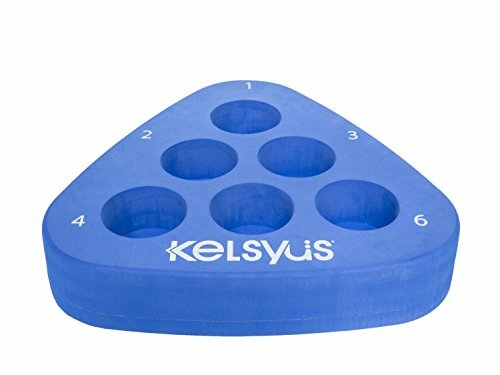 Kelsyus Floating Pong is a game station and floating drink holder in one! Fill up some plastic cups with your favorite beverage and place them in the numbered holders. Take turns tossing a ping pong ball into the cups. If someone lands the ball in your cup, then bottoms up! Made of sturdy thick buoyant foam for added stability in the water. Can also be placed on a table top to secure cups during gameplay, helping to prevent tip-overs. Perfect for lake and pool parties, backyard barbecues, and tailgating. You supply the plastic cups and ping pong ball. Take turns tossing a ping pong ball into the cups. If someone lands the ball in your cup, then bottoms up! If you have any questions about this product by Kelsyus, contact us by completing and submitting the form below. If you are looking for a specif part number, please include it with your message.